When you buy leather goods, and specifically leather boots, you commit to caring for them in the best way. 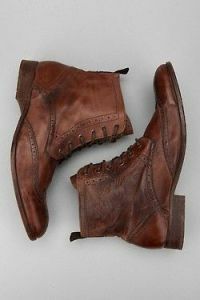 Leather boot care can be slightly intensive, but if you take the time to do it, your boots will last forever. You can care for your leather boots in three steps: cleaning, condition, and polishing. During the winter months, boots are a huge staple in many people’s wardrobe. They provide warmth and protection from harsh winter climates and add a stylish flair to any outfit. Your winter boots need to withstand the elements for multiple seasons to get as much value as possible out of them. One way to ensure that happens is to clean them regularly. Here are a few easy ways to keep your leather boots clean so they will last for several winters. When cleaning your boots, the first and most important thing to do is to loosen and remove any surface debris. This debris, like dirt and salt, can be harmful to the leather, so if it’s buffed into the boot, you run the risk of ruining your shoe. Once the loose debris is removed, use a horsehair brush to buff the surface of your boot and remove any stubborn substances. It’s recommended that you repeat this step once every other week. Next, take a damp rag and swirl it in a pot of a saddle soap until it starts to lather. Test the soap on a small part of the shoe to make sure that it won’t cause a permanent stain. Run the rag across the entire surface of the boot, paying attention to any areas that are stained or need extra scrubbing. Allow that to dry for at least 10 minutes. You don’t have to use saddle soap each time you go to clean your boots, only if you notice that your shoes need a little extra cleaning. Knowing how to condition leather boots is an essential step when you’re caring for them. Conditioners are useful for moisturizing the leather and keeping the fabric hydrated and soft. Once every 1-3 months, break out your conditioning kit. When you’re ready to condition your boot, it’s a good idea to, again, test a small spot on the shoe to make sure that the conditioner won’t discolor the leather. Work the conditioner over the boot and add more conditioner as needed. Conditioning may temporarily darken the shoe, but as it dries, the original color will show through. Once a week, be sure to polish your leather boots to keep them moisturized and shiny throughout the winter. You can use either shoe cream to provide the boot with additional moisture and nourishment or a wax-based polish to give a more pronounced shine. Either way, it’s important to find a polish that matches the color of your boots as closely as possible. Start with a small amount (a little goes a long way!) and add more polish as needed to produce maximum shine. Another benefit of polishing your leather boots is that the polish creates a barrier between the boot and debris, which keeps them looking fresh for longer. After the polish is dry, give the shoes a brush with the brush you used to shine your boots with to provide them with a final buffing to expose even more shine. In addition to cleaning your boots when they are already dry, you need to know how to care for your boots when they are wet. You can use a water-resistant spray, but it’s not generally necessary. Depending on the type of leather you get, your boots will naturally be water-resistant, but it’s important to care for wet boots to avoid cracking and fading. The good news is that it’s pretty simple to keep them looking pristine after they get drenched – let them air dry! Never set your wet boots directly in the sunlight or by a fire because it could dry your boots too quickly, causing them to crack. Whether you’re an avid cleaner of your leather boots or you’ve slacked a little this season, it’s essential to get your boots professionally cleaned at least one time during and after the winter so you can have a fresh pair of gorgeous boots to wear and store. To get the best service and results on the market, put your trust in Mulberrys. Mulberrys is proud to offer leather cleaning and shoe shine or repair services that will care for your favorite shoes and boots. We can’t wait to service your shoe shine and repair needs so don’t hesitate to visit our store, schedule a pickup, or give us a call to learn more.